Every so often, a photograph becomes more than the moment it captured. It’s yellowed from hanging on the wall of a chain-smoking aunt, or its edges are wavy from that time the basement flooded. These types of heirlooms are faded, worn, sometimes recolored or restored—like our memories of them. They take on a history, a weight of their own. And in saving them, and more importantly, in sharing them—in passing them hand-to-hand around the table amid reactions of reminiscence, laughter, and loss—we carry that weight together. We find strength. William Stratton’s debut book of poetry, Under the Water Was Stone, evokes this feeling, seating the reader at a table among friends sharing stories of struggles and triumphs. In a striking synthesis of voices, Stratton delivers poems that show immense tenderness, sorrow, joy, and above all else, strength. 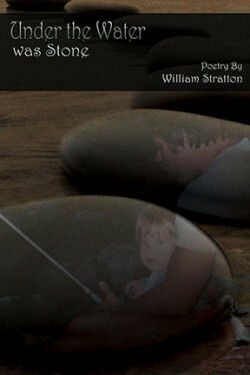 These poems, and Stratton’s book as a whole, are fortified through the effective contrast of tones, perspectives, formats, and subjects both within individual poems and among the poems themselves. Arranged in five sections, “Family,” “Friends Beloved,” “Self,” “The World,” and “Home,” the structure of Under the Water Was Stone provides a frame without limiting flexibility. Poems about loss and family benefit from the contrast of love poems and lyric observations of the world—yet because everything fits into the sectional structure, even poems with very different tones or subjects support the work as a whole rather than seeming out of place. But this deliberate lugubriousness is interwoven with phrases so straightforward in their emotional honesty that it almost seems suspicious for them to appear in a poem. “I am sorry for my grief” (“Float”) and “I am terrified to lose you” (“Torn”) demonstrate a rare quality—they’re beautifully vulnerable, and these moments of vulnerable sincerity work to ground lines that have an almost epically elegiac quality to them. In addition to creating a synthesis of tones, one striking aspect of Stratton’s collection is its synthesis of voices. We hear poems in the voice of the speaker’s grandfather, who lost his arm to the corn picker and “asked [his] grandson for one last bottle, scotch,”; in the voice of Shorty, living in his house of pallets and logs, who “done told them [he’d] never sell.” In “Fire, Chenango County Poorhouse, May 1890,” we hear an account of a historic tragedy from the perspectives of five separate characters. The effect of all of these voices is multifold. From a purely poetic perspective, it creates a chorus that adds a rich timbre to the work as a whole. But it’s also possible that these voices are making a claim about the identity of poetry’s rightful heirs: that poetry belongs to everyone. The hunters, high school wrestlers, the bartenders—even a character named Jared (despite the assertion that “There are no poems for Jared / Not even this one.” More important than the poems simply being about these sorts of everyday characters, though, is that it isn’t hard to imagine Jared grinning at the poem that mentions him, or a wrestling team nodding along with Brandon as he recalls the iron taste of blood. These aren’t academic portraits meant to be examined from a distance with a hand on the chin, but snapshots that capture the verve of their subjects with esteem and sincerity. The most important thing isn’t just that there’s a poem about Jared, but that Jared might care—might even recognize in it something of himself that he thought no one else had cared to notice. When discussing poetry, it’s customary to reject any supposition that the poems spring from a place personal to the poet. We dutifully discuss “the speaker” and “the characters” to avoid the terrible insinuation that maybe, just maybe, the poet has decided to share something profound with us from his own experience. I certainly would not dare to assert that this is what Stratton does—but I would say that this is what it feels like he’s doing, and as such his work comes across as both intensely personal and startlingly universal. Reading poems from Under the Water Was Stone feels as though the poet is passing us a photo from our shared past. We are wandering the old logging roads with him, with the poems at our side, too. And we are sharing the weight together, and together laughing, gently patting a shoulder, holding each other close against an almost-breaking voice. Lauren Shimulunas is a graduate of the MFA program at the University of New Hampshire. Her work has appeared in Blue Collar Review, Cider Press Review, The Cortland Review,Paper Darts, and elsewhere. She currently coordinates the supplemental instruction program at the University of Wisconsin-Stevens Point. William Stratton. Under the Water Was Stone. Winter Goose Publishing, 2014. 98 pp. $10.95, paper.